Regatta Marine Essentials is a small business dedicated to offering marine accessories and tools to make your boating experience as enjoyable and hassle free as possible. We offer essential boating products at sizes and prices that are reasonable and convenient for any boat owner. We know you don't need just 1 dock tie because we know you don't have just one cleat on your boat. We want to prepare you for all sides that need ties and back ups when necessary. We also want to pass along savings for your preparation. 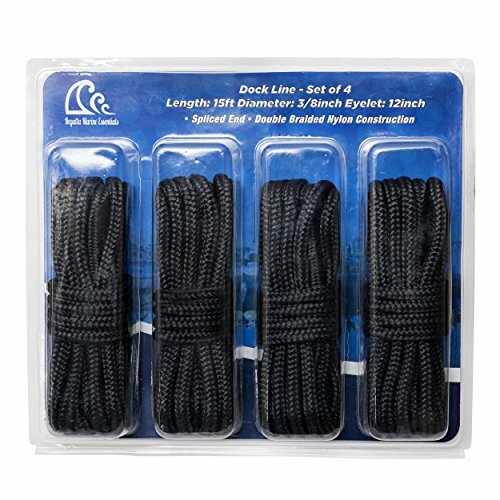 That is why we have created a conveniently packaged 4 pack of high quality, double braided nylon dock lines for all four cleats on your boat. Each dock tie is 15ft. in length and 3/8 inch thick in diameter. If you own a small to medium sized boat these are likely the largest and thickest dock ties you would need to secure and maintain your boat. Our SeaSense Solid Braid Nylon 3/16" x 75' Anchor Line is designed primarily for boats under 16' in protected waters. Plated steel snap-hook with large 3/4" mouth, to accommodate any anchor design. This line is 75' in length, with a spring hook spliced end. 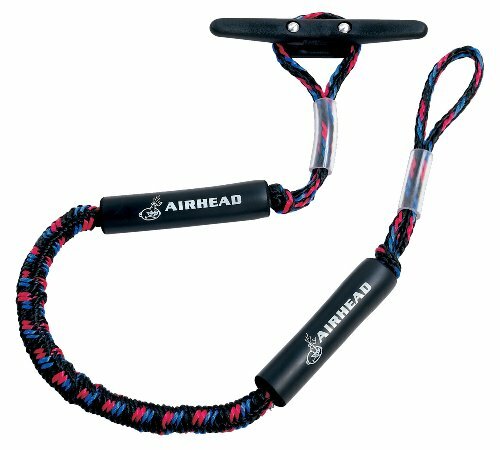 It's designed for a light load, with solid braid nylon construction, and has a 580lb break strength and a 63lb safe working load. Not for overnight use. Packed in poly bags, for easy display. 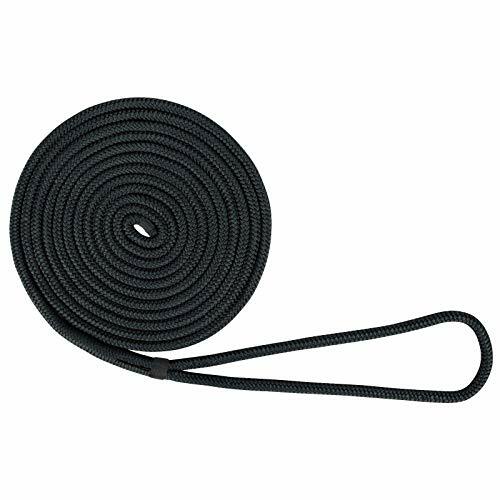 Designed to help absorb shock to boats, cleats, docks, pylons, and other hardware, a bungee cord is hidden inside the rope and acts as a built-in snubber. The 2 foam floats protect the boat from chafing, and there is a sliding adjustment at both ends for quick docking. This line is recommended for docking boats and PWCs up to 3,500 lbs. (1,887.6 kg). Bungee Dock Lines have a tensile strength of 2,150 lbs. (975.2 kg). The Bungee Dock Lines stretch to the following lengths: 4' (1.23 meter) stretches to 5.5' (1.68 meters), 5' (1.52 meters) stretches to 7' (2.13 meters) and the 6' (1.83 meters) to 9' (2.74 meters). Rainier Supply Co produces high quality marine grade double braided nylon dock lines that are built to last. Every dock line is made of high quality material that is ultra-strong and oil, rot and mildew resistant. Our soft double braided nylon is easy on your boat finish and comfortable for the boater to handle. 2 PACK: Dock lines for boats avalable in 15' x 3/8" and 25' x 1/2" with 12" eyelet. Must have of boat accessories available in a 2 pack. Double braided nylon is ultra strong with a higher tensile strength than other dockline materials. By design, it has an ideal combination of decreased stretch and increased shock absorption in addition to being salt water, oil, rot and mildew resistant. 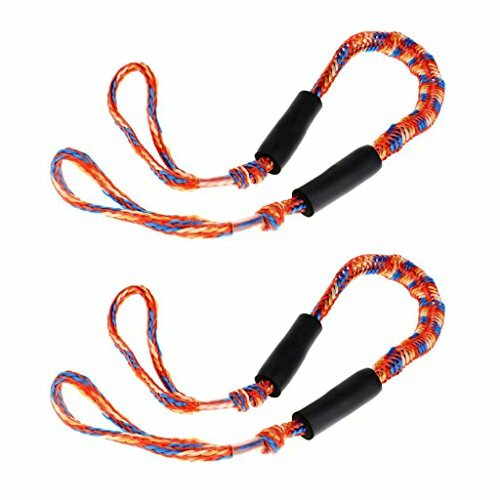 Soft double braided nylon boat ropes for docking that are easy on your boat finish and comfortable to handle. Heat treated and professionally whipped at the throat and bitter end of the line to ensure long term durability. 12 Eyelet included on every marine rope. Scotty #793 Throw Bag is a bright orange nylon and polyester self-draining bag that comes with adjustable strap and 3M reflective safety band. Braided MFP polypropylene floating rope: 50' x 9/32"" 550 lb. test. Ravenox manufactures the softest 100% multifilament polypropylene (MFP) rope on the market. Perfect for any & every use, our rope is made here in the United States on 20 carrier braiding machines - that's eight more than anyone else! We make 22 solid colors & dozens of color combinations, all with 5 diameter options - 1/4", 3/8", 1/2", 5/8" or 3/4". We offer pre-cut lengths of 25, 50 & 100 feet hanks of rope and also full spools. Soft, supple & extremely flexible, it is easy to tie knots in and splice and it's waterproof as well as resistant to most oils, lubricants and grease making it the rope of choice for yachting, sailing, water rescue lines & vehicle tie-downs. Unlike dyed ropes it is manufactured with color fibers so that the color is vibrant throughout and does not bleed. This rope is machine washable and easy to care for. Our derby rope has an average tensile strength that is very strong and exhibits a lower stretch, making it a good choice of rope for beginners and experts alike. 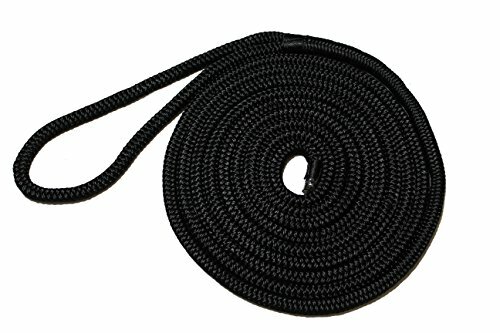 Great for camping, tie-downs, emergency rope, horse halters, horse leads, dog leashes, barriers, path marking, boating or just a general-purpose utility rope. It floats, resists rot & mildew and is perfect for use around the water. You can tie up just about anything you like, and it is a more economical and lighter weight alternative to nylon or polyester rope. Ravenox is a CERTIFIED Service-Disable Veteran-Owned Small Business and our rope meets the rigorous manufacturing, safety & testing procedures set forth by the American Cordage Institute. We are proud to be 1 of only 29 manufacturers in the world that helps set the standards in rope manufacturing. 1/4-Inch : 6 mm : 700 lbs. 3/8-Inch : 10mm : 1,390 lbs. 1/2-Inch : 13 mm : 2,100 lbs. 5/8-Inch : 16 mm : 2,950 lbs. 3/4-Inch : 19 mm : 4,300 lbs. FEEL THE DIFFERENCE - Ravenox utility rope is made on 20 carrier braiders in the USA. This means more strands of yarn braided together for a softer rope with more color uniformity and a higher quality appearance. Just about every other manufacturer uses a 12-carrier braider for this type of rope. 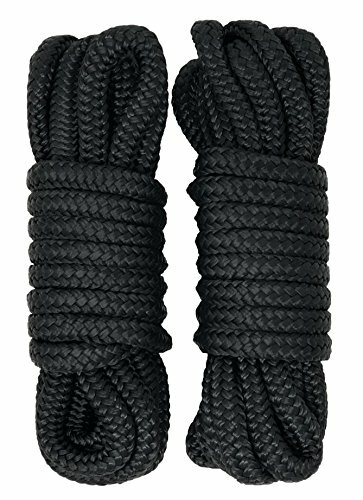 This is the softest braided utility rope available. MORE ECONOMICAL AND LIGHTER THAN OTHER ROPES. 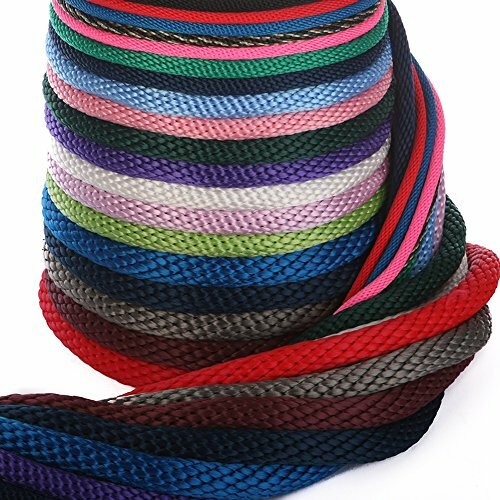 Solid Braid Multifilament Polypropylene (MFP) Derby Rope is a more economical and lighter alternative to nylon or polyester rope. MFP rope floats, resists rot and mildew and is perfect for using around the water, docks or on boats. Derby rope is machine washable and easy to care for. It also meets the safety specifications set forth by The Cordage Institute and has a high average tensile strength and exhibits a lower stretch. DERBY ROPE IS GREAT FOR CAMPING, tie-downs, emergency rope, horse halters, horse leads, barriers, boating or just a general-purpose utility rope. It is also commonly used in knot tying classes, theater rope, decorative rope and as tack rope for equine use - hence the name Derby Rope. 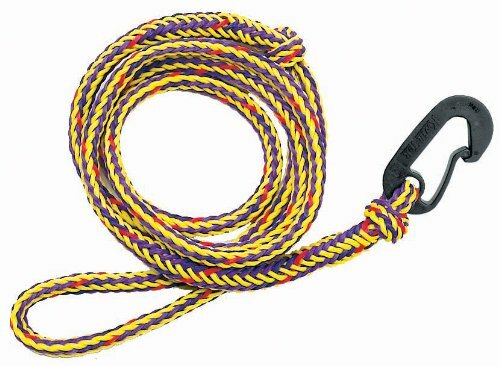 This is also one of the most popular ropes for dog leashes. This rope is easy to maintain and stays round under load bearing weight. MORE COLORS THAN ANYWHERE ELSE - Ravenox manufactures 22 solid colors and dozens of color combinations. The multifilament fibers are pre-dyed without any harmful chemicals making the colors vibrant without bleeding or fading. Each color is available in 5 popular diameters: 1/4-inch, 1/2-inch, 3/8-Inch, 5/8-inch or 3/4-inch and is cut to length and packaged in 25 feet, 50 feet and 100 feet variations. Bulk rope is also available in full spools by the thousands of feet. Extreme Max BoatTector products are designed to provide optimal protection for boats and watercraft. Every item we offer has been carefully selected for its durability and performance in harsh marine conditions. This premium dock line is ready to use, with a spliced 12 soft eye and heat sealed bitter end. Nylon has great strength and shock load resistance, handles easily, and resists sunlight better than all other synthetics. Double braid offers an excellent combination of minimal stretch with excellent shock load reduction. BoatTector Double Braid Nylon Dock Lines will not float. All Extreme Max BoatTector line and cordage products are designed for optimal utility and durability, and carry a limited lifetime warranty. * Working Load Limits shown are guidelines. This product is intended for non-critical consumer applications. Not to be used for overhead lifting, or in applications with a risk of death, personal injury or property damage. Bungee cord docking line that absorbs shock to boats, cleats, and docks. Bungee mooring lines are your collection of great boating accessories! Peace of Mind and Security while your Boat is Docking. Eliminate the Jerking, Tugging, and Banging on your Boats and Anchor. "Stretches" as your Boat, Pontoon, PWC, Jet Ski, or Kayak Drifts from Rough Waves or Wind. Great Compliment to your anchor. Loop and Slider at each End for an Easy Attachment to your Boat, Dock, or Anchor. Use it for your Boat, Kayak, or anything else you want to hold at the dock. The bungee cord is hidden inside the line to act as a built in snubber. Bungee dock lines are the "MUST HAVE" boating accessories when boating, kayaking, or jet skiing! Quality is important when it comes to the integrity of your watercraft, and with Starr Lines docklines you can rest assured that your vessel will be safe in any harbor. With standard sizes including 3/8'', 1/2'' and 5/8'' we make sure that you have the appropriate line to match the size and weight of your boats. Starr Lines uses Double Braided Nylon (DBN) in all our docklines to ensure peak performance and protection. Double braided Nylon is one of the strongest and most dynamic materials used today, with breaking strengths from 4,000 to 8,000 LBS (varying by size) and preferred by professional sailors around the globe for its shock-absorbing characteristics. Not only is it powerful, DBN is also extremely resilient facing the harsh elements of the sea with resistance to UV, rot, abrasion and most chemicals that may come into contact with your ropes. We pride ourselves on our product so much that, if you feel the products you have received from us are not simply the best performing products for your craft, we will happily replace or refund your purchase. Whether enjoying a weekend on the lake or roaming the open ocean, we want to bring you the best equipment the world has to offer. 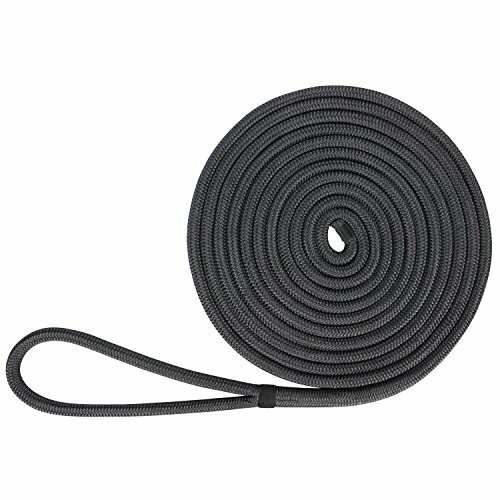 Dock Line with Nylon Snap Hook - These dock lines are incredibly versatile and functional. A giant snap hook is spliced to one end for attaching to ski eyes, cleats, bow eyes and mooring rings. There s a 10 loop on the other end for attaching to dock cleats. Finished length is 7 ft. Great for PWC s and jet boats. 2 per package. Ravenox UnManila polypropylene rope cordage is manufactured in the USA with the contractor and landscaper enthusiast in mind. Our rope is the epitome of strength and confidence. Polypropylene rope or ProManila looks similar to natural manila rope. It's made from triple-strand polypropylene, synthetic fibers, and twisted polypro rope that is lightweight and a strong shock absorber. It's a synthetic version of the classic manila fiber. Marine rope is best used in wet environments as it's resistant to extreme temperatures, weather, UV rays, chemicals, oils and abrasions, therefore, rot-resistant. Twisted polypro rope fibers are high-tensile strength for longer-lasting knots and performance, which makes it a good choice for treehouses, railings, and outdoor decorations. 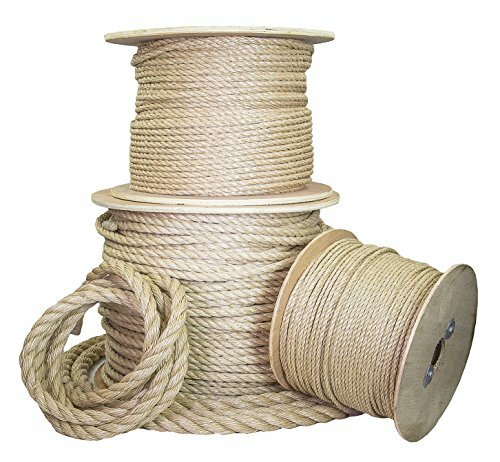 Our marine rope is a versatile, all-purpose utility cord ideal for a wide range of indoor and outdoor applications such as nautical, marine, ranch, farm, landscaping, and indoor decoration. The nautical rope is excellent for the great outdoors as it can handle the toughest weather conditions. The battle rope can be used in competitive, athletic events as tug of war rope. The smooth appearance delivers a polished and decorative appearance. Although it doesn't have the natural fibers of Manila rope, it does have the same scent. Nautical rope d cor is a cost-effective alternative that provides a noticeable performance boost over natural manila. Commercial and outdoor use including home improvement projects could leverage this ultra-stylish and chic design. We offer UnManila rope in a variety of lengths and diameters: 3/16-inch, -inch, 5/16-inch,3/8-inch, -inch, and 2-inch. We have many diameters to select for your project. We've thought through the small details to provide peace of mind and confidence while mastering each twist and turn. Now, it's up to you. Get started and Order Today! POLYPROPYLENE ROPE ALTERNATIVE: Natural look with man-made strength and a waterproof finish. Choose UnManila (or ProManila) rope, a synthetic version of Manila rope with polypropylene fibers. Twisted polypro rope fibers are high-tensile strength for longer-lasting knots and performance, which makes it a good choice for treehouses, railings, and outdoor decorations. NAUTICAL ROPE FOR GREAT OUTDOORS: Excellent for the great outdoors as it can handle the toughest weather conditions. The battle rope can be used in workouts, competitive, athletic events as tug of war rope. The smooth appearance delivers a polished and decorative appearance. Although it doesn't have the natural fibers of Manila rope, it does have the same scent. NAUTICAL ROPE D COR COST-EFFECTIVE: Cost-effective alternative that provides a noticeable performance boost over natural manila. Commercial and outdoor use including home improvement projects could leverage this ultra-stylish and chic design. Indoors it can be used in lighting artwork or displays. MARINE ROPE FOR WET ENVIRONMENTS: Our marine rope is a versatile, all-purpose utility cord ideal for a wide range of indoor and outdoor applications such as nautical, marine, ranch, farm, landscaping, and indoor decoration. Best used in wet environments as it's resistant to extreme temperatures, weather, UV rays, chemicals, oils and abrasions, therefore, rot-resistant. BATTLE ROPE 100% RISK-FREE: We are a USA, CERTIFIED, Service-Disabled, Veteran-Owned, Woman-Led business that offers a one-year, money-back guarantee on all tug of war rope purchases. This is for one (1) quality nylon double braided dock line in 5/8" diameter and 35' long. This rope features high abrasion and impact resistance. This rope has a breaking load of 8430 lbs. Nylon rope is resistant to mildew, oil, and gas and UV resistant. The rope is professionally spliced with a 3" eye on one end and heat treated on the other end. 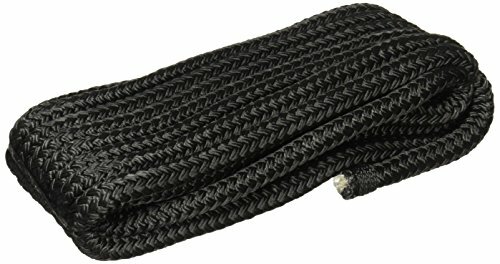 This is for one (1) quality nylon double braided dock line in 1/2" diameter and 15' long. This rope features high abrasion and impact resistance. This rope has a breaking load of 4380 lbs. Nylon rope is resistant to mildew, oil, and gas and UV resistant. The rope is professionally spliced with a 3" eye on one end and heat treated on the other end.